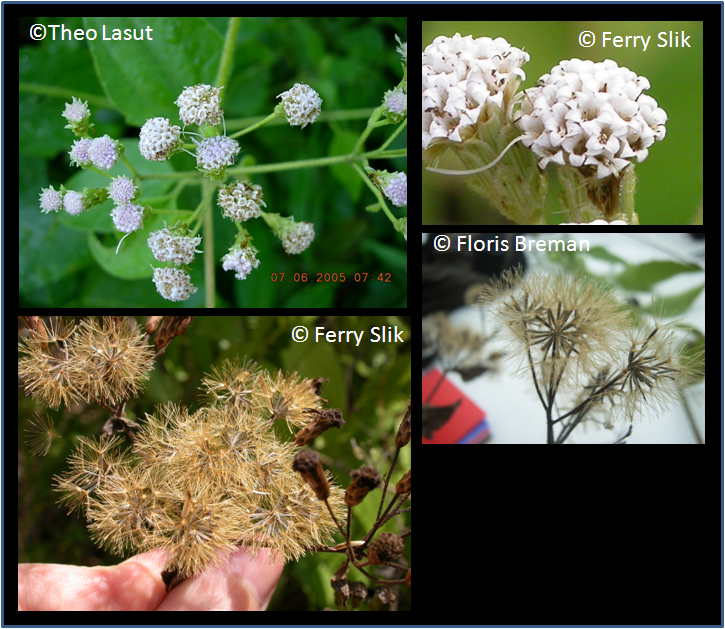 Eupatorium affine Hook & Arn. Eupatorium conyzoides var. angustiflorum Cuatrec. Eupatorium conyzoides forma angustiflorum Cuatrec. Eupatorium conyzoides var. floribunda (Kunth) Hieron. Eupatorium conyzoides forma glabratum Hassl. Eupatorium conyzoides var. heterolepis Griseb. Eupatorium conyzoides var. scaberulum Hassl. Eupatorium conyzoides var. tambillense Hieron. Eupatorium odoratum var. brachiatum (Sw. ex Wikstr.) DC. Eupatorium odoratum var. cubense DC. Eupatorium odoratum var. mallotophyllum B.L.Rob. Eupatorium stigmatosum Meyen & Walp. Native to South and Central America and parts of the southern USA, but now spread all over the tropics. Medicinal, the young leaves are crushed and used to treat skin wounds in Indonesia. Also an ornamental plant that is sometimes encouraged for use in shifting slash-and-burn agriculture to compete with Imperata cylindrica (alang alang or cogon grass), which is harder to control. English: Bitter bush, Christmass bush, Chromolaena, Common floss flower, Jack in the bush, Siam weed, Triffid weed. Indonesia: Rumput belalang, Rumput golkar, Rumput putih.